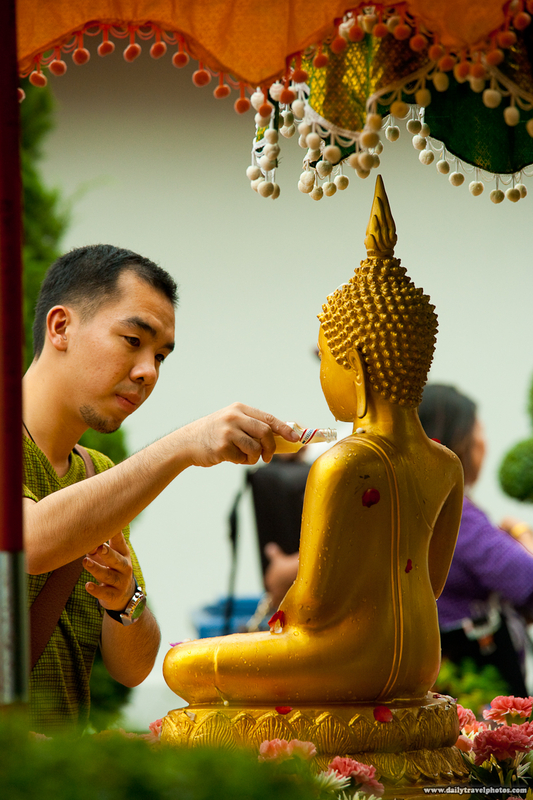 A Thai man gently pours a small bottle of perfume onto a Buddha statue for Songkran. Technically, Songkran kicks off tomorrow, on the 13th, but temples all over Bangkok have already begun ceremonies to mark the new year. At Wat Pho, Buddha statues were set up since the weekend in order to allow them to be washed or perfumed. Tomorrow begins the water fighting portion of Songkran for three consecutive days. Technically, the water fighting should stop by Saturday however, it's widely assumed that Songkran will bleed inexorably into the weekend. Unless one stays indoors, that's 5 full days of unavoidable wetness! A young Thai girl gently bathes a Buddha statue for the beginning of Songkran. Note the care Thai people take to bathe Buddha with a light spritzing of water or perfume. Soon, that all abruptly changes when the entire city explodes in a chaotic battle to violently drench one and all . Marauding, open-bed trucks full of armed Thais will drive aimlessly targeting the dry and innocent. Confused and disheveled foreigners, fresh from the airport will wonder why they are the favored targets of the water-gun toting mobs' malice. I'll be taking a calculated risk by bringing my dSLR out into the madness despite the knowledge that it's 1 drive-by tuk-tuk shooting away from malfunction. More Songkran photos to come!